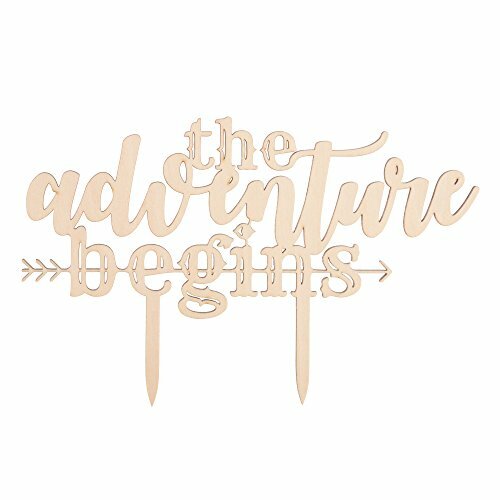 Ella Celebration The Adventure Begins Wooden Wedding Cake Topper, IMPROVED Arrow Rustic Wood Decoration 8 Inch Width (Adventure Begins) by Ella Celebration at My Beautiful Cake. Hurry! Limited time offer. Offer valid only while supplies last. Get the Best for the Big Moment: This gorgeous cake topper will be the perfect addition to your wedding or anniversary cake! Celebrate becoming Mr.
Get the Best for the Big Moment: This gorgeous cake topper will be the perfect addition to your wedding or anniversary cake! Celebrate becoming Mr. and Mrs. and beginning your adventure by adding this beautiful, rustic topper to your reception decorations. This piece could also be used as part of a centerpiece, wreath, or in a floral arrangement. Fits Many Cake Sizes: Whether you're planning to feed 500 people or just a few dozen, this piece will fit atop any sized dessert. Getting married is a big deal, and this 8 inch wide piece will make it clear that it's time to celebrate the bride and groom! Buy this beautiful wedding cake topper today! Enjoy it as a precious keepsake for years to come. ATTENTION GRABBING: Measuring 8 inches wide and 5 inches tall (including prongs), everyone in the room will take notice of your centerpiece dessert. If you have any questions about this product by Ella Celebration, contact us by completing and submitting the form below. If you are looking for a specif part number, please include it with your message.